As used here, a hub is a center of activity, from which multiple (at least three) spokes (links connecting the hub with other locations) emanate. On a network with a tree structure, the primary hub is the point from which the maximum number of spokes emerge. There may be secondary and tertiary hubs on the network as well. The proposed US system (see Figure) , such as it is, has no well-thought out national architecture. There were a number of independent proposals that have been drawn on a single map. 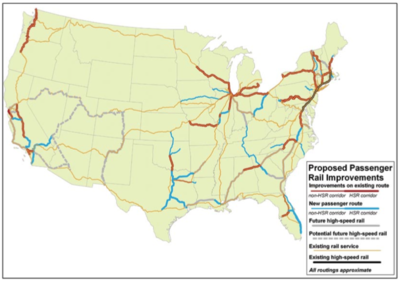 The existing Northeast corridor, the only US claim to HSR, such as it is, is part of the national “plan”, though it received the least funding from the American Recovery and Reinvestment Act of 2009 (see the top right on ) . 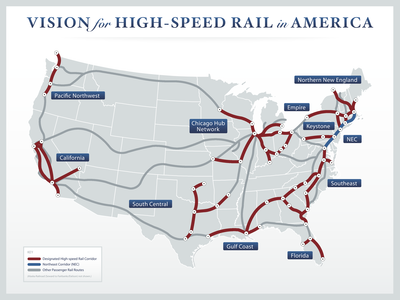 The Northeast has the most developed network with semi-high-speed rail (Acela) running from Boston through New York to Philadelphia, Baltimore, and Washington. 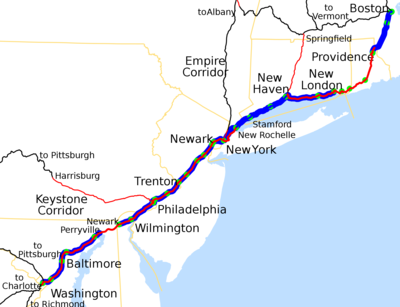 This could be described as a New York Hub (though it has not been pitched as such), with current non-high speed lines from New York emanating in particular to Albany and then to Rochester and Buffalo or to Montreal, and spurs from New Haven to Burlington, from Philadelphia to Harrisburg and Pittsburgh, from Washington south to Richmond and Raleigh, and from Boston to Portland and Brunswick, Maine, all of which have been proposed for upgrade to high speed. 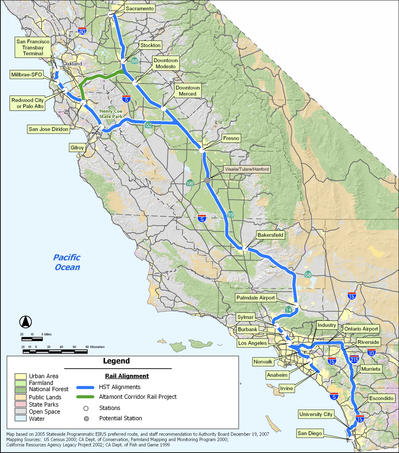 The proposed California Corridor, is based on a mainline that runs from San Francisco, through California’s Central Valley to Los Angeles, with extensions to Sacramento and San Diego. The long-term vision of the national program has a line from Las Vegas to Los Angeles. With all of the commuter rail already in the Los Angeles region, the network could more accurately be described as the Los Angeles Hub. Even the Sacramento line is more oriented to Los Angeles than San Francisco, despite the distance. The most coherent of the new proposals is the Chicago Hub, which as its name suggests, hubs traffic from other Midwestern cities into Chicago. This proposal has achieved agreement from all of the regional governors, and with a Chicago-based administration in the White House, not surprisingly received a large share of the recent federal allocations ($2.6 Billion). 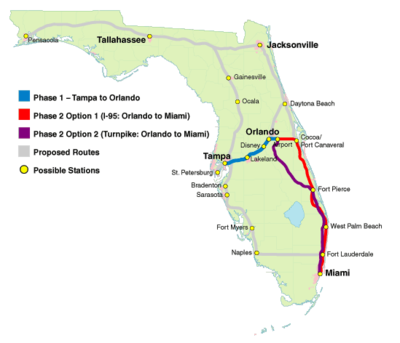 The proposed Florida High-speed rail system runs from Miami though West Broward, West Palm Beach, to Orlando, Lakeland, terminating in Tampa with about 10 stations planned. Proposed additional extensions connecting Fort Myers, Jacksonville, and Tallahassee and Pensacola have also been drawn on maps, but these are farther into the future. This could be described as an Orlando Hub. Though Miami is a larger metropolitan area than Orlando, the branching structure is naturally geographically based in Orlando due to it centrality on the Florida peninsula, as well as it central location vis-a-vis tourist traffic. Tourist traffic is important to this line, as stops at Disney and Port Canaveral have been included. It is anticipated the line will carry 2 million travelers yearly ( 5500 per day on 12-18 round trips), and is 324 miles in length in total. With 10 stations, there is an average of 32 miles between stations, which will bear nuisance costs, and 10 station areas, which will see accessibility benefits. The line is anticipated to run along the I-4 and I-95 corridors for significant stretches, so those areas already see some accessibility benefits (at on-ramps and off-ramps) and nuisance costs (between interchanges). The Northwest region, or Seattle Hub connects Vancouver, Canada with Salem, Oregon. The South-Central region, once dubbed the Texas Triangle, and now the Texas T-Bone, may be described as a Dallas Hub, connecting San Antonio, Austin, Houston, New Orleans, Oklahoma City, Little Rock, and Memphis, among others. The Southeast region is probably best described as an Atlanta Hub, as Atlanta is the key interchange in the region (hubbing traffic from Savannah, Jacksonville, Birmingham, Chattanooga, Nashville, Charlotte, and Raleigh), and the largest metropolitan area. There is also a line from Raleigh through Columbia to Savannah, bypassing Atlanta, which is helpful for long-distance train travelers from the Northeast going to Florida, but might not have much local demand. The Gulf Coast Corridor, or New Orleans Hub connects Houston to Mobile and Atlanta. This is an official FRA corridor, but seems on a slower track than many of the others, not receiving funding in the most recent round. The long term program includes a line from Phoenix to Tucson (a Phoenix Hub), and from Denver to El Paso (a Denver Hub), but these are both isolated corridors, indicated on the long-term vision, without any likelihood for construction in the short-term. Describing these as hubs stretches the meaning of the term, but those are the primary cities on the respective networks, and are the only cities on their networks with significant feeder public transit. While these local spokes do not show on the national high-speed rail network, they still exist, and support the use of the term for these locales. 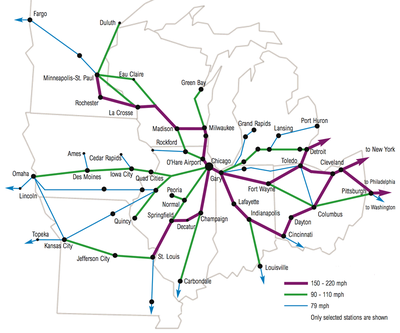 Several cities tie together multiple hub networks, these include New Orleans (connecting the Dallas and Atlanta networks as the hub of the Gulf Coast Corridor), Raleigh (connecting the Atlanta and New York networks), Louisville (connecting the Chicago and Atlanta networks), and Kansas City (connecting the Dallas and Chicago networks). Those with an eye to drawing networks would easily conceive of links (not yet on the books) connecting Memphis, Nashville, and Knoxville in Tennessee, or Pittsburgh and Cleveland or Columbus. 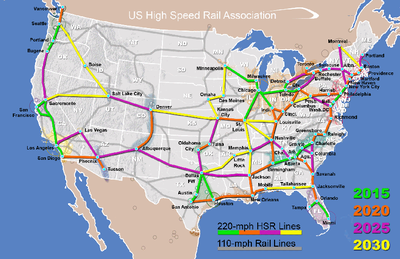 The unofficial US High-speed rail Association has the most comprehensive network plans, including staging, which includes many of these and other links, see the bottom left on . 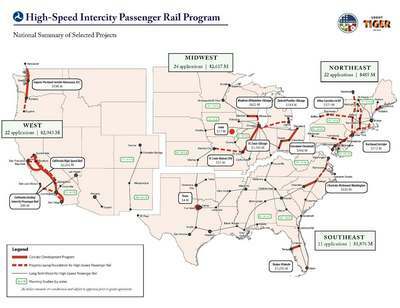 These hub networks in the Federal High-Speed Intercity Passenger Rail Program includes the top 47 metropolitan areas of the United States (and many smaller ones), the largest city not on the network is Salt Lake City, Utah, at 48, with just over 1 million people in the metro area 5. The Hubs themselves are metro areas ranked 1, 2, 3, 4, 9, 15, and 27.6 The US High-speed rail Association network includes even more cities. The political genius of the proposed intercity passenger proposal is that it includes lines in all but 8 of the 50 states7. 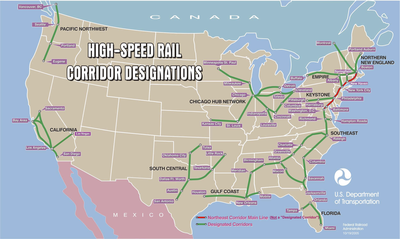 This is a practice learned in transportation from previous national packages, the Interstate Highway System (with miles in all 50 states (special routes in Alaska and Hawaii), as shown in the bottom right of ) and Amtrak (nearly so), helping ensure strong support in Congress. 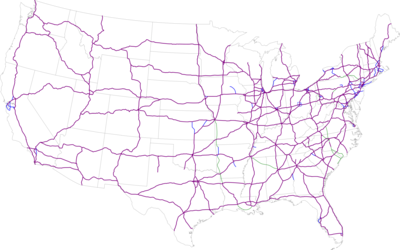 (6) Interstate Highway System 13. (4) Northeast (New York Hub) 17.